Rhiannon Jones, from The Secret Garden Club in Whitley Bay. A project is looking to blossom again, thanks to the generosity of residents in Whitley Bay. The Secret Garden Club runs sessions and clubs to introduce children to growing plants and vegetables. At the end of the season, they will learn how to make various meals with the vegetables they grow. But owner Rhiannon Jones was left devastated last week after returning from a fortnight away to find that all the recently-planted flowers, pots and troughs had been stolen. 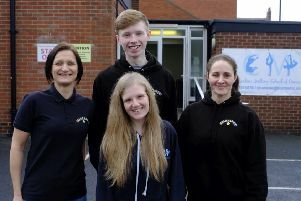 However, after sharing the news on social media, she was overwhelmed by the response from local residents who descended on the club’s base at the Whitley Bay Young People’s Centre with help and donations. Rhiannon, a self-employed gardener, said: “I put in all my spare time for free with other generous people who volunteer their time to attempt to create a safe and friendly haven for our children to learn how to garden in. “These were planted at the first garden club session two weeks ago to try to introduce some happy chirpy colours within the new garden space for the youngsters to appreciate. “Summer bulbs were also planted to emerge later in the year to show them the wonders of gardening surprise. “I was gutted and furious all at once. “I had to tell the children what had happened and why people steal. They just asked why people would do that. They couldn’t understand it. “It’s not a nice thing to have to explain to children. “Last Saturday we held our second children’s gardening club and I was overwhelmed by the response. Random members of the public turned up, bringing plants and flowers with them. “It was all for the children. I’m amazed at the response we’ve had. “People are so kind. It’s great that something positive has come out of something bad. “People are still getting in touch to donate flowers and money. I’m going to continue with this project, I won’t be beaten. “We’re now looking to raise funds to purchase a security fence around the garden and new materials as well.